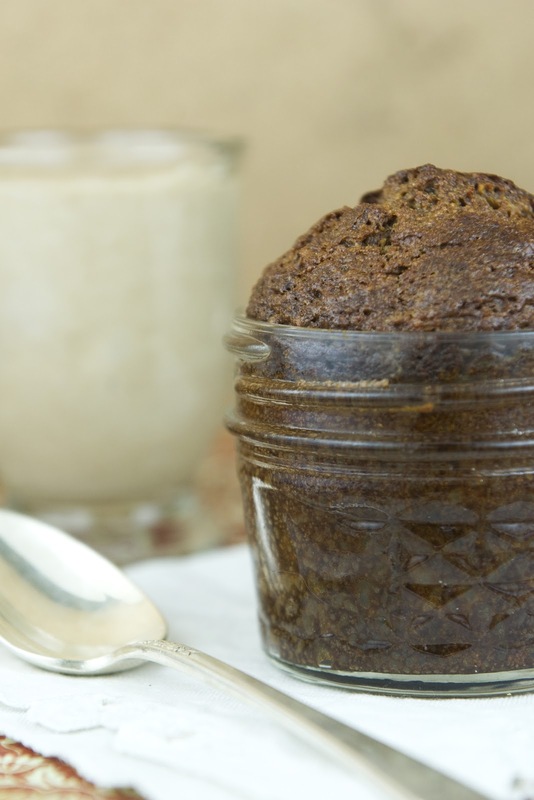 You can also make this quick bread in small canning jars. I found these jars at a thrift store and they make the perfect single size portion for desserts. Bake them at the same temperature, just not as long. They will rise above the rim and this is a good sign they are done. 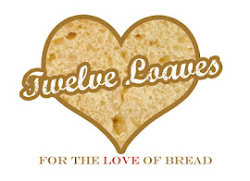 Twelve Loaves is a fun group of bloggers and bakers that focus on baking breads, yeast or quick breads, from scratch. Lora, from Cake Duchess, is the creator behind the group. Each month a theme is decided upon and she or others host the party. To learn more about Twelve Loaves you can visit Lora's page here. This month's theme is apples or pears. You can find Lora's beautiful recipe for Apple Bread Ring here. This will also take you to the link party where all of the recipes are being hosted in one place. When you see these recipes you will be blown away, the ladies that contribute to this group are all amazing bakers. In fact I have been stalking the group for a few months and wondered to myself if I could fit in. I love to make bread. It is something I have been doing for years for my family. Of course, that all changed a few years ago when I found out I could not eat any wheat based bread. I missed working with wheat and flour. I dabbled a bit here and there for family gatherings to keep myself practiced in the art of baking a fine loaf of bread, foccacia, a dozen or two rolls or my favorite, breadsticks. I still have a few recipes on the blog that are not gluten free from my earlier days of bread baking. Last month I decided that I needed to get back to making bread, yeasted or quick bread, and prove to myself that I could still get in the kitchen a produce a quality but gluten free loaf of deliciousness. 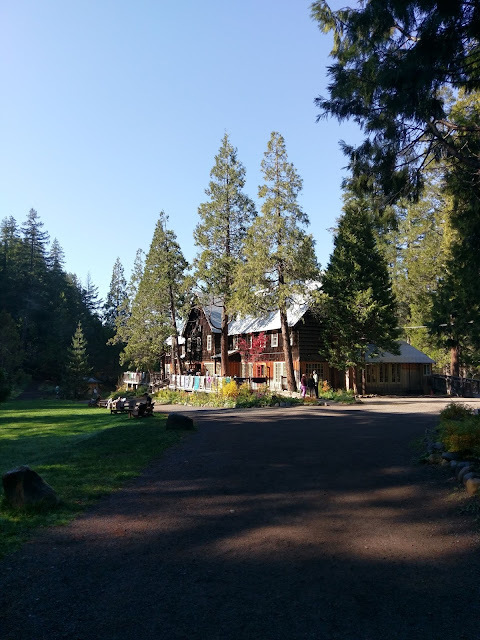 I instant messaged my friend, Jamie, from Life's a Feast to get the details and to see if there was an interest in a participant that could offer some gluten free choices to the bread discussion and recipe sharing group. I was welcomed to participate and so here I am with my first recipe for Twelve Loaves. I decided on making a quick bread. A quick bread is a style of bread that uses baking soda as the leavening agent and not yeast. One quick bread that everyone enjoys and loves is banana bread. Making these quick breads gluten free is very easy. I work mostly with almond meal and this flour will create the perfect quick bread texture and flavor. I had an idea of the combination that I wanted to use and went in search of finding recipes that shared a similar combination of flavors. 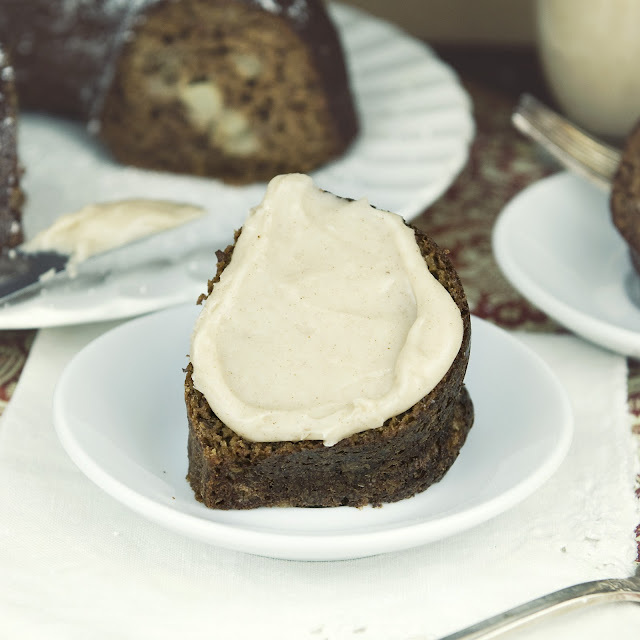 I wanted to first see if gingerbread and pears went together. 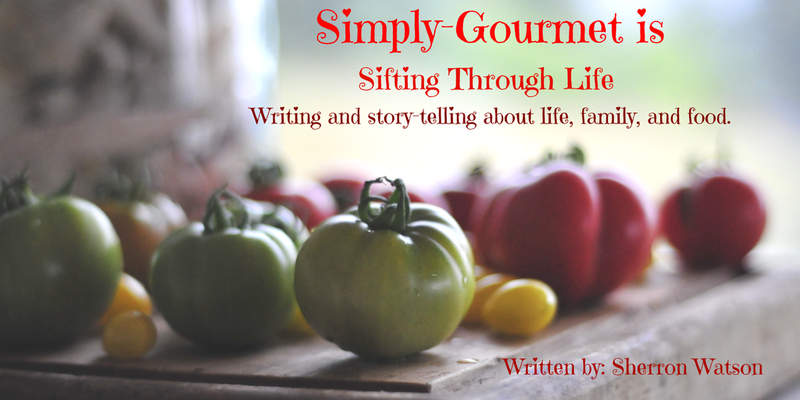 I was happy to have found several gluten free recipes that were very close to the one I wanted to make. I used my recipe for Harvest Cake as a place to start. I love this quick bread and it works every time. 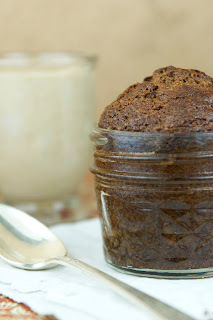 I also found a recipe by Meg at Sweet Twist of Blogging for Pear Bread. I have just recently posted a recipe for Gingerbread Granola that was out of this world. The full and rich flavor of molasses shined through with the hint of cinnamon, nutmeg, ginger and cloves. I wanted this cake to also have that same exceptional flavor. I sat on this idea for about two weeks working out the flour combinations in my mind. Working with gluten free flour is a test in how well you listened and followed directions in your high school science classes..LOL Mixing the flours with the starches and other ingredients can be tricky and if you over or under calculate you can end up with quite the creation. Sometimes it works and sometimes it does not. This is why I love almond meal. It seems, for me at least, to be the one guarantee when it comes to baking gluten free that I know well and it always turns out. This makes working in the kitchen with gluten free ingredients a joy. I have come across very few recipes that I am not able to convert to a gluten free version. Once you understand the combinations and ratio's, then a whole new world of baking and recipe development opens up. You no longer have just one flour to use but many. You no longer have white or wheat to choose from but amaranth, sorghum, rice, millet, oat, coconut and a so many more. Each of these flours offers something unique to the recipe, texture and flavor. To learn more about gluten free flours and baking, I would suggest that you visit a few experts in the field. Gluten Free Goddess was my go to site for many months while I retrained myself to work in the kitchen after first discovering I had Celiac Disease. Karina has a wealth of information on her site. This recipe was a wonderful treat for my family to wake up to this past weekend. It made my home smell like gingerbread and browned butter. It was a warm breakfast on a cold morning. It was a healthy alternative to cereal or toast. 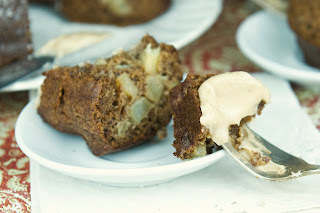 What I loved the most about this quick bread was when I took each bite, I was able to enjoy a piece of pear. That little hint of sweetness along with the gingerbread flavor was wonderful to my taste buds. I have kids and sometimes they like a bit of sweetness to be added to their cakes. I made brown butter frosting for those in my family that needed a bit of a sugar fix (recipe below). 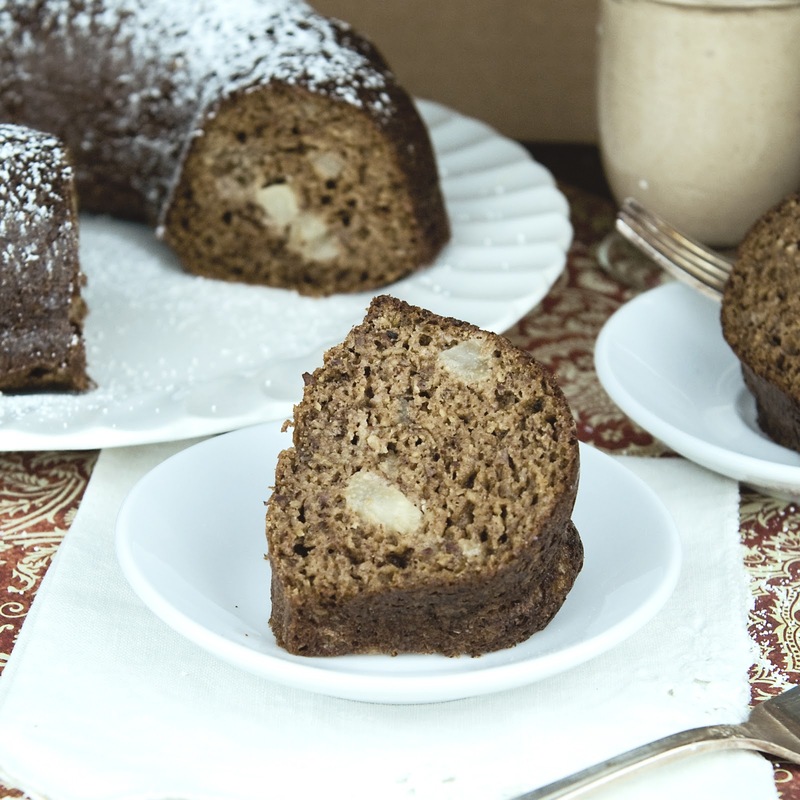 Please enjoy this Gluten Free Gingerbread Pear Cake. Preheat oven to 350. Spray your pan well with a non stick baking spray. You will need three bowls. Third bowl: Beat 2 egg whites until peaks form. Combine the first and second bowls and stir well. Add diced pear pieces. Stir. Gently fold in egg whites from third bowl. Spray a small Bundt pan and pour batter until it is 1/2 inch from top. 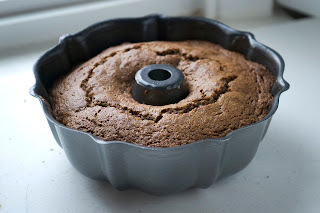 My Bundt pan measured 8.5 inches across the top from side to side. 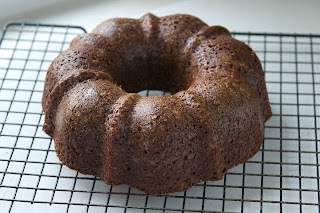 If you do not have a Bundt pan you could use an 8X8 square baking pan. Bake for 25-30 minutes or until the top springs back when gently pressed. Cool in pan for 5 minutes and remove to a cookie rack to cool completely. Keep covered in plastic wrap and store in refrigerator for continued freshness. Serve with powdered sugar sprinkled over each sliced piece or a small spoonful of brown butter frosting. Using a small saucepan, add butter and cook until butter starts to turn brown and has a very nutty aroma. Remove from heat. Cool for 10 minutes. Add vanilla and milk, stir well. Slowly add powdered sugar until desired consistency is met. The more you add the thicker it becomes. The combination of ginger and pears is one of my favorites. 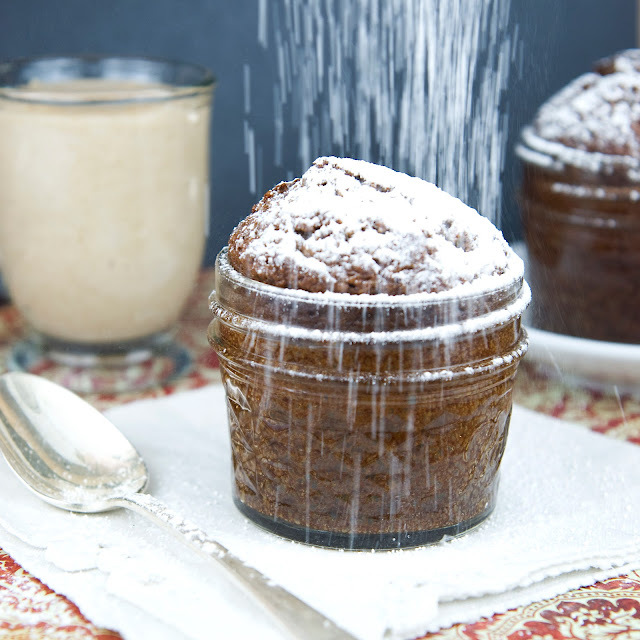 This quick bread is gorgeous and I especially love that first picture of powdered sugar raining down on the bread. Lovely! PS... Welcome to Twelve Loaves!! It's such a fun group. I've really been enjoying it each month. Hope you will too! Can this be baked i jars like in first few pics? Or in muffin tins? If yes how long? I am so bad a figuring stuff like that out lol! Thanks for offering us a gluten free choice. Will have to give this one a try. This gluten free gingerbread pear quick absolutely something new for me! Looks yummy! I'm also gonna pin this post on my Pinterest board my followers will love it. Thx for sharing recipe, i definitely add it to my cookbook!